La Barriada was formed in 1995 under the direction of trumpet player Juan Kemell, by a group of ENA graduates, some of whom had been friends since childhood. They chose the name of the band to reflect the importance of the lifelong bonds formed in the neighborhood and the significance of these roots to the music of the orchestra. Over the past 15 years La Barriada has toured Japan, Spain, France, England, Belgium, Holland, Germany, Greece, Venezuela, Mexico, Denmark, Finland, Norway and Sweden, playing everything from salsa clubs, to jazz festivals to fashion shows. The trademark of the group is the elation that the audience feels during their concerts. In Kemell's own words "What we try to do when we're working is to bring a party so that the people feel good, feel happy, that they dance, forget all the problems in the world, forget all the bad things. That's the idea." You don't need to speak Spanish to enjoy La Barriada. Their music and performances supersede language barriers. La Barriada plays a combination of Cuban genres such as son, cha-cha-cha, salsa and timba as well as other Latin American music such as bachata, merengue and cumbia. Juan Kemell y La Barriada have many fans throughout Latin America and enjoy representing the culture of the entire Caribbean in their music. Juan Kemell himself was born in Bauta in the province of Havana but grew up in Sancti Spíritus, and carries with him strong influences from trova and conga. Since the departure of founding members Osmani Collado and Julio Montoro, who also contributed songs, Juan Kemell has been the principle writer/arranger for the band. The songs also develop during rehearsals where everyone is free to make suggestions such as a new coro or a change in the mambo. The band plays two regular, weekly gigs in Havana but during the carnival season they tour the provinces, keeping in touch with the audiences outside the capital. The direct contact with the audience is a very important aspect to the band. 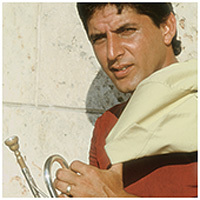 La Barriada has to date released 5 CDs, all of which have been praised by the critics. The 2008 release "Havananza" included both a CD & DVD and was choosen as one of the "Best of 2008" at Descarga.com and was equally appreciated by the fans. If you haven't heard La Barriada yet, you are in for a treat. I recommend starting with "Adios a la Tristeza" and "Havanaza".